This month has been a great one for two organizations that hired Hathaway Communications to handle their PR efforts. 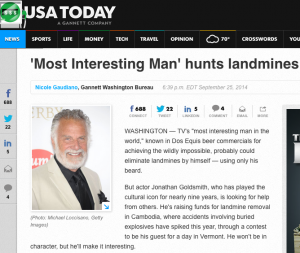 MAG America, the U.S. entity for Mines Advisory Group hired Hathaway Communications to assist with a fundraising campaign featuring Jonathan Goldsmith, the actor who plays “The Most Interesting Man in the World”. The effort raised thousands of dollars for mine-clearance efforts in Cambodia, and MAG got great media results with features in USA Today, Foreign Policy and more. Goldsmith has volunteered for the Mines Advisory Group since visiting the non-profit group’s operations in Vietnam last year. MAG has worked in more than 35 countries and shared the Nobel Peace Prize in 1997. The contest will benefit the organization. John Rogers, my old boss at The Orvis Company, called me when he took on the role as Executive Director of The Eugene Bell Foundation. 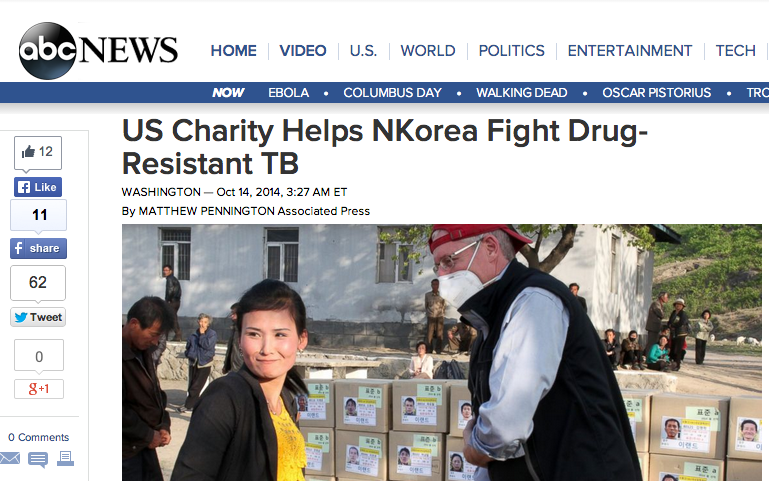 EBF works in North Korea to stop the spread of multidrug resistant tuberculosis (MDR-TB) and cure those afflicted. John and I had done some exciting work together at Orvis and he wanted my help to raise the visibility of his organization. Today a story by Matthew Pennington of the Associated Press went on the wire telling the story of EBF and their important work. The increased visibility will not only bring global attention to an increasingly urgent health issue in a remote and difficult to reach part of the world, but will also help in fundraising efforts for the DC-Based organization. 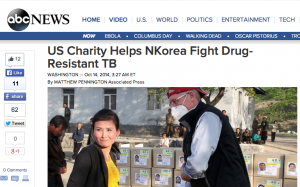 Despite worsening U.S.-North Korean relations, an American charity is ramping up efforts against an epidemic of multidrug-resistant tuberculosis in the isolated country, where it says it is making inroads in fighting the deadly disease. The Eugene Bell Foundation travels to North Korea twice a year, bringing high-end equipment and drugs to treat TB patients at old-world facilities. The disease has found fertile ground in North Korea, where the population has been weakened by malnutrition since a famine in the 1990s. The foundation returns this month on a whirlwind, three-week mission to help hundreds of patients. Congratulations to MAG America and to The Eugene Bell Foundation. Thank you for letting me play a role in your important work!